The Root DNS has recently been digitally signed (~2 weeks ago) as announced on its root DNS webpage. In other words, the signed root zone with actual key (as a root trust anchor) is now ready and available for validated DNS queries and transfers, including its security-aware child zones. Microsoft also recently published an updated 80+ page implementation guide of DNSSec on Windows server 2008 R2. Note that DNSSec is not Microsoft or any vendor proprietary standard but is ratified by IETF in RFCs 4033, 4034, and 4035. But why DNSSec is important? Everyone understands that DNS is the yellow-pages of Internet. However, it is weakly implemented in terms of security standards, as it is vulnerable to spoofing attacks, in particular DNS cache poisoning. To highlight its importance, we need to first understand the inherent security weaknesses on traditional DNS. During this chain of recursive lookup, the resolver just weakly verifies the authenticity of the response based on some matching parameters (i.e. XID value, ports, addresses, and query types) that are sent in plain. Parameters, such as ports (default UDP 53) and remote server address value, can be easily guessed. Only XID value may present some challenge, as it is randomised. However, the challenge is not insurmountable, as it is only 16-bit long. This weakness may allow a malicious attackers to guess the right values and send spoofed DNS response to your ISP servers, hoping to alter the cached DNS records. The malicious user can also increase his odds of success by sending many spoofed UDP response packets, each with different XID values. 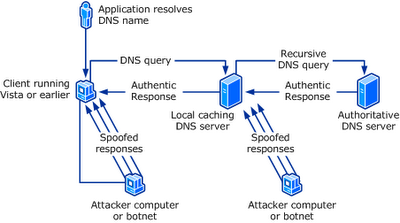 The attacker can insert any DNS data of his choosing into the response for the queried name and type. For example, the malicious user can place the IP address of his own server in a spoofed response to a query for the Web site of a bank like dbs.com.sg or online merchant. In another possible MITM (man-in-the-middle) attack scenario, a malicious network engineer in some large ISPs may plant a rogue DNS server to intercept any DNS queries from the smaller downstream ISPs and return any values that he wants. Obviously, the results can be catastrophic. In my next post, I will discuss about how DNSSec can provide authentication and integrity protection to circumvent these attacks. Recently, the WAN upgrade to our ISP is complete with dual redundant paths. We were asked if we could allow our Internet surfing users utilizing both links as much as possible instead of leaving one link to be idle most of the time. At the same time, it must not break the existing path redundancy. Since BGP rules Internet routing, we are using it to our advantage. We further break our public IP subnet into 2 halves i.e. 160.1.1.0/30 and 160.1.1.4/30 and advertise them via both R1 and R2. On R1, we prepend AS path on advertised route 160.1.1.4/30 to make it less desirable for inbound traffic to use this route via R1. On R2, we prepend AS path on route 160.1.1.0/30. On R1, higher local preference is set for default route (0.0.0.0/32) advertised from ISP R1. Hence, ISP R1 will be the preferred next-hop for all outbound Internet traffic entered via R1. As for R2, the next preferred next-hop will be ISP R2. In summary, the path will become R1 <-> ISP R1 and R2 <-> ISP R2. We influence inbound traffic by making the other route less attractive and outbound traffic by making the route more attractive. If either R1 or R2 link were down, the remaining active link will take over all the traffic. As for load-balancing between our routers (R1 & R2), it is more straightforward. Have both routers to advertise default route (on same metric) into the IGP (e.g. OSPF or RIP) by using "default information-orginate" router command. Alternatively, you may prefer GLBP (Gateway Load Balancing Protocol) for multiple clients. # exact routes must exist before they can be advertised in eBGP! We just brought in some new stackable Dell PowerConnect 6248 switches, which compete against the Cisco Catalyst 3750 series. The Dell switches cost slightly under half of what Cisco 3750 switches would normally cost. I ran through the console and noticed that the CLI was unwittingly similar to Cisco IOS. Most of the basic L2 and L3 switch commands (e.g. switchport, spanning tree, ip route etc) are there, except VRF-lite which I used it extensively to separate the different routing domains for management and security purposes. Another noticeable difference is that Dell doesn't allow you to perform routing on the management vlan interface, which is defaulted to vlan 1. If you intend to route on vlan 1, you would need to create a new vlan & assign it as the management vlan. delays in applying the configuration. bootp Set the protocol to bootp. dhcp Set the protocol to dhcp. none Set the protocol to none. vlan Configure the Management VLAN ID of the switch. Specify an IP address in A.B.C.D format. The default subnet for Management VLAN is 192.168.2.0/24. If it overlaps with your other VLANs, you would have to change the subnet as well.